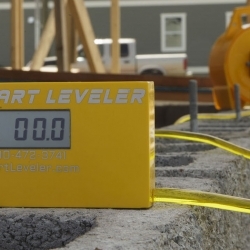 Smart Leveler® digital water level helps engineers and contractors quickly identify problems with foundations. Its compact size, easy set-up and one-man operation make it ideal for those working alone. Our level has incredible accuracy of +/- 1/10” and 200 ft. working range with 100 ft. of tubing. For the foundation contractor, it’s wise to use the same technology for measuring elevations and identifying problems as those who are responsible for inspecting your work. Smart Leveler delivers accurate, indisputable digital data outputs and is used by home and building inspectors throughout the U.S. and in many foreign countries. Our level is priced at less that half the cost of competitive levels, enabling contractors to equip each of their crews for a more efficient operation.